Casemiro has stated his that he wants to feature for the Real Madrid first team, regardless of being on loan at Madrid’s Castilla side. The 20-year-old is contracted to Sao Paulo but is on loan to Madrid’s reserves, and los Blancos have the option to make the move permanent at the end of the season should they so desire. However, the Brazilian has his sights set on a much higher goal: playing for the Spanish side’s first team. “I’m going to play in the first team of Real Madrid,” Casemiro claimed to Lance, by way of explaining why he elected to join the side’s second string as opposed to accepting offers of a place in the first team of the likes of Roma and Lazio. The industrious midfielder’s representative, Joseph Lee, is equally confident. He said: “Casemiro is not a player suited for a reserve team. 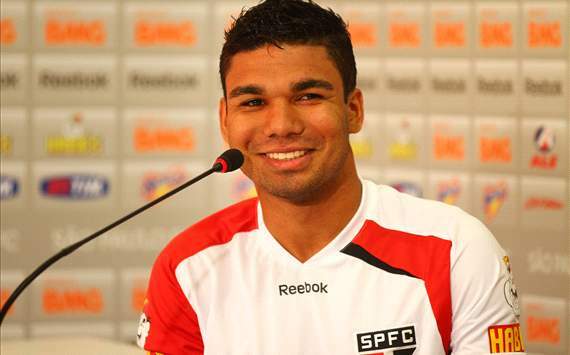 Whilst the claims of the midfielder and his representative might seem a little presumptive, Casemiro has already made over 50 appearances for Sao Paulo, won the Under-20 World Cup in 2011 and has three caps for Brazil’s senior side.